Stephen traditionally venerated as the Protomartyr (first martyr) of Christianity and according to the Acts of the Apostles, he was one of the first seven deacons in the early church at Jerusalem and it is stated that he had the face of an angel. Stephen aroused the enmity of members at various synagogues because of his teachings. He was accused of blasphemy and was tried. At his trial, Stephen made a long speech denouncing the Jewish authoritie who were sat in judgement of him and he was sentenced and stoned to death. His martyrdom was witnessed by Saul of Tarus who was a Pharisee who himself would later become a follower of Jesus Christ. The only primary source of information about St. Stephen is to be found in the New Testament book of Acts of the Apostles and in Acts 6, he is mentioned as one of the Greek=speaking Hellenistic Jews who was chosen to fairly distribute welfare to the Greek=speaking widows. Stephen is stated to have been full of both faith and the Holy Spirit and to have also performed miracles among the people (Acts 6:58). Stephen’s name means crown and he was the first of Jesus’s disciples to receive the martyrs crown. 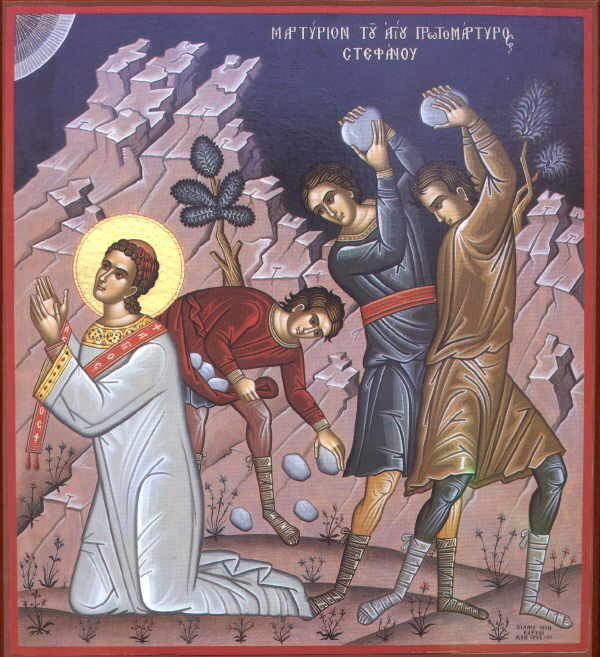 St.Stephen the Martyr has feast day on December 26th. Please ask the Most Holy Trinity to fill my soul and the souls of all my brothers and sisters throughout the world with a deep hunger for the truth that comes from the heart of Jesus, and also with the loving courage to embrace and profess the truth even amid difficulties, confusion and persecution. May the serenity and peace which were yours at the hour of your stoning be ours as well as we wait in hope for the coming of the Lord Jesus Christ who lives and reigns for ever and ever. Amen.